Online entry for the 2019 Welsh Open and Classic is now open. To place your entry please click the "Enter Online" button below. Find the perfect holiday and select Prestatyn Sands 9th May 2019 and they must put in the offer code box WDPR and click use code. You can book your accommodation at Pontins for the 2019 Welsh Open by visiting the following link www.pontins.com and then click on find the perfect holiday, select Prestatyn Sands 9th May 2019, you must put in the offer code box WDPR and click use code. This will give the options for 3 or 4 nights with prices for Club, Classic and Popular, click on which one you would like to book and this will then take you through the booking Process. Linen is included for guests in Club Accommodation, for anyone booking classic or popular you can choose to add Linen or bring your own. To be held on 23rd - 24th March 2019 at the Penydarren Social Club. Tramroad Lane, Merthyr Tydfil, CF47 9BZ. 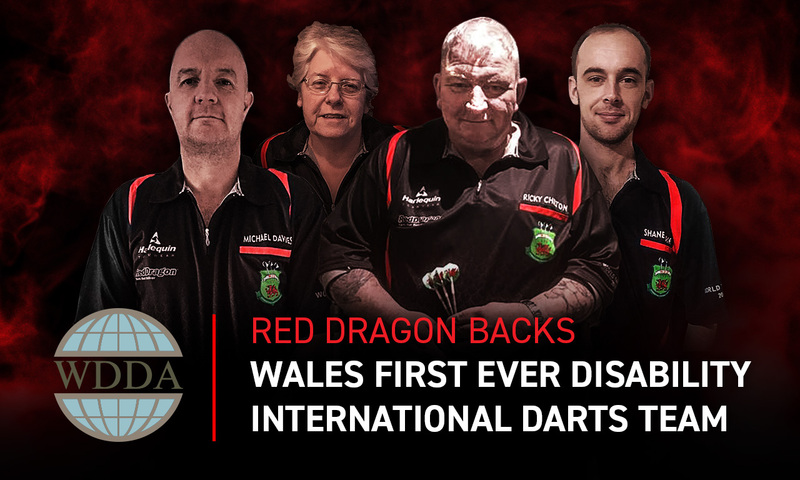 Red Dragon Darts agreed on the first-ever sponsorship by backing the Wales national disability darts team of "Ricky Chilton, Michael Davies, Michelle Gabica, Shane Havard ", helping them to travel to the inaugural World Cup being held in Belgium from 22nd February. Gwynedd County thrower Eirig Rowlands from Pwllheli captures the Gwynedd Open title with a 6 - 1 final winner over last years' Champion Heber Thomas (Gwynedd). Glen Durrant joined Scott Waites in the BDO World Professional Darts Championship final after he defeated Jim Williams 6-3 in a classic encounter at the Lakeside Country Club. Waites conquered Michael Unterbuchner earlier in the day and will now go for a third BDO World Championship title. Middlesbrough based Durrant led for a majority of the contest but would lose the opening leg on throw as Williams steamed out of the blocks. Three legs of the spin including a Shanghai 120 checkout gave the Welshman the early advantage. A stunning 110 checkout in the final leg of the second set would level proceedings as Durrant began to gather steam. An excellent third set would allow Durrant get his nose in-front as Williams’ scoring slightly dipped. ‘Duzza’ averaging over 100 for the match at the time would double his cushion with a 3-1 win in the fourth set, but Williams was far from down and out. The number three seed would be pushed all the way in set five, but ultimately held his nerve with 105 checkout reducing the deficit. The duo would exchange blows as Durrant held a narrow advantage with the match continuing to go with throw but set eight would prove to be a turning point. Six perfect darts for ‘The Quiff’ would put Williams in with a shout, Durrant’s relentless scoring not letting up just yet. A 115 outshot putting daylight between the two as Williams’ chances began to fade. The tie would be put to bed in the ninth and final set, as Durrant confirmed his place alongside Waites in Sunday’s final. He swooped on a missed 140 checkout from his opponent as he stepped up to the oche to throw for the match. He would seal the match in stunning fashion, taking out 123 on double nine. Durrant will now contest his third consecutive final as he looks to match Eric Bristow’s long standing BDO World Championship record. Glen Durrant is still on course to match Eric Bristow’s record of three consecutive World titles at the Country Club, but in order to reach that coveted third final he will have to beat Wales’ Jim Williams. ‘The Quiff’ came through a marathon contest with Scott Mitchell to reach this stage but will have to up his performance one more notch to defeat the tournament favourite. 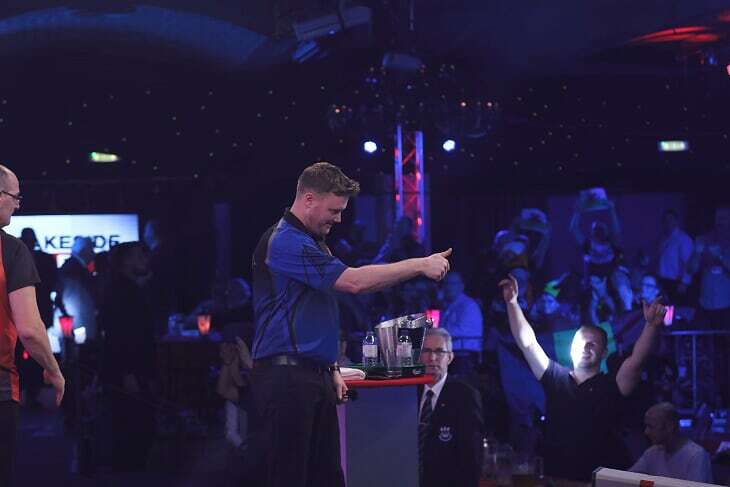 In a marathon contest Jim Williams defeated Scott Mitchell to reach his first Lakeside semi-final. The animated Williams pressurised the Dorset thrower throughout the contest but could never quite fight off the resilient ‘Scotty Dog’ as he stuck with him throughout. The Welshman would overturn a 2-0 deficit to take the first set, and the following three sets would follow a similar pattern, all three going all the way to a decider with the player who started the set emerging victor. The crucial moment would come in the eighth set as Williams broke away, a 79-check-out doing the job as he seized the advantage. As Williams held a 2-1 lead in the pivotal set, Mitchell nearly cracked in the shot of the tournament. Two treble twenties and a narrowly missed dart at tops giving the 32-year-old the chance to seal the deal. Williams obliged, taking out 64 on double 16 to reach his first ever Lakeside semi-final. 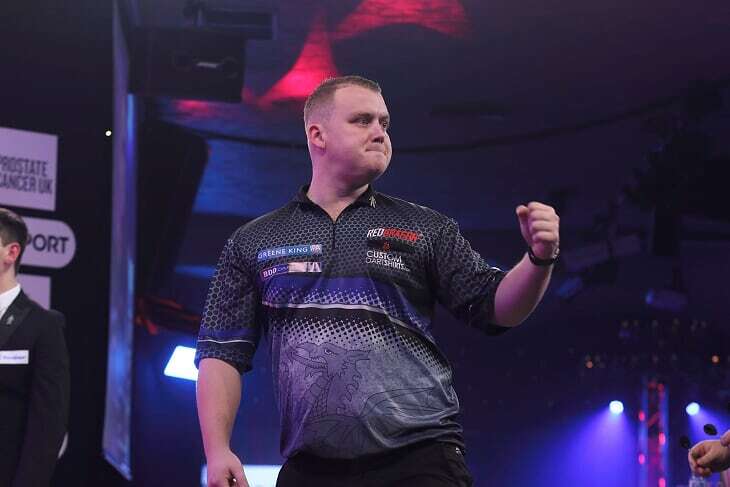 After a gruelling opening round clash first round tie with Roger Janssen, Jim Williams made light work of fellow Welshman Dean Reynolds to reach the quarter-final stage. ‘The Quiff’ reached the final eight twelve months ago, crashing out to eventual champion Glen Durrant on that occasion. Williams will be confident he can go a step further this time around following the convincing win over his Welsh teammate. The 34-year-old would take the opening set with a ton plus average, not allowing his opponent a dart at the outer ring. A 90-check-out would tie up the second set of the match as Reynolds struggled to get out of first gear. A frustrated Reynolds would continue to scrap but get very little change out of a confident looking Williams. The Welsh number one would confirm the whitewash in the fourth and final set, taking out 62 for a crushing win over a devastated Reynolds. Williams will face either Scott Mitchell or Krzysztof Kciuk in the quarter-finals. 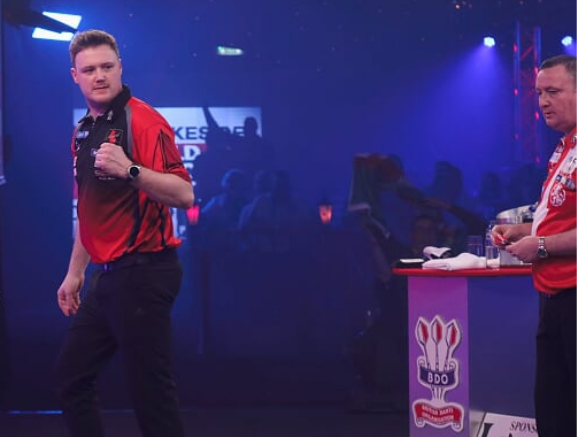 Michael Unterbuchner stormed into the quarter-finals of the BDO World Professional Darts Championship with a spectacular 4-0 victory over former Wales captain Wayne Warren. This is the heaviest recorded victory on the Lakeside stage for the German, who will be looking to go one step further this time around. Two ton plus checkouts in the opening set of the match got the ball rolling for the German star, but the best was still to come for ‘T-Rex’. 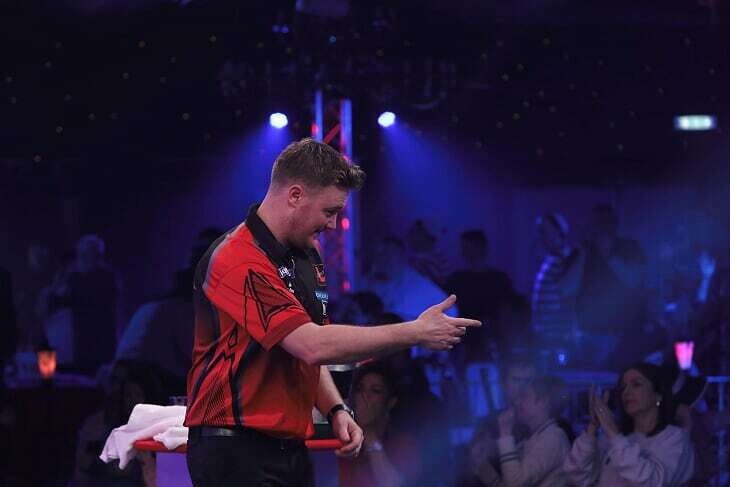 His average lifted well over the 90 mark as he extended his advantage of Warren, the Welshman struggling to gain traction after an excellent opening display against Mark Layton on Sunday evening. A clean sweep in the third set put the finishing line in sight for Unterbuchner, and the win would be confirmed after just four sets of play. A magical 130 checkout on double five sealing Unterbuchner’s place in the quarter-finals for the second consecutive year as he set up a tie with Willem Mandigers on Friday. Wayne Warren faces German star Michael Unterbuchner in one of the most hotly anticipated clashes of the second round. Warren, 58, recorded a 98 average against Mark Layton, the highest of the opening four days. His number five seeded opponent was pushed all the way by Justin Thompson in round one, so will need to up his performance if he is to defeat former quarter-finalist Warren. After sneaking through their respective first round encounters, two of Wales’ finest dartists meet in the second round on Wednesday evening. Reynolds has decent record against his highly ranked opponent, winning ties at the BDO World Trophy and Scottish in the past 18 months. Williams game has come on a great deal in the past year, and will go into the clash as a heavy favourite. 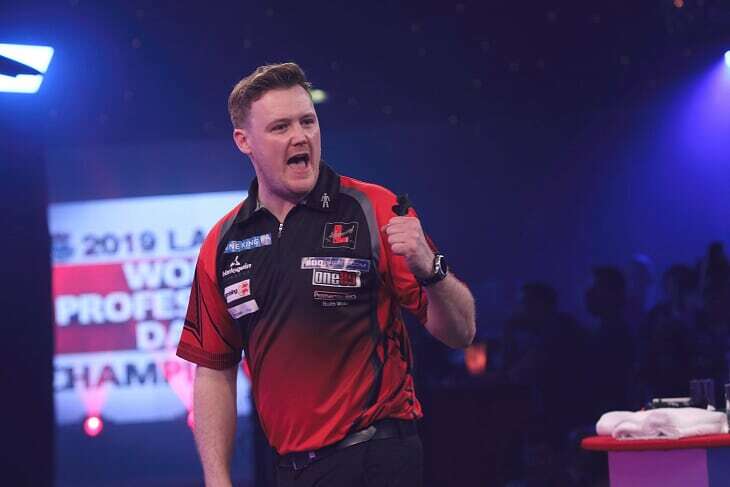 Dean Reynolds progressed to the second round of the BDO World Professional Darts Championships for just the second time as he defeated Daniel Day in the final match of Monday’s evening session. The young Welshman had suffered heart-breaking defeated to former World Champions Scott Waites and Glen Durrant in recent years, but have another chance to record a career best at the Lakeside as he faces Jim Williams in the last 16. In the early stages it looked although Reynolds was heading for a routine victory, a tops-tops finish along with a superb second set giving him a clear cushion. But back came Day, a clutch 97 checkout halving the deficit as he found a way back into the contest. ‘Dynamite’ would return the favour with a 97 checkout of his own in the first leg of the fourth set, but the skin-saving shot was yet to come. A scintillating 130 on the bullseye sending his supporters delirious in the Lakeside as he went one away. Day would chalk up one more leg before Reynolds nailed 56 setting up a tie with fellow Welshman Jim Williams in round two. Jim Williams breathed a sigh of relief as he won a pulsating match under extreme pressure against Belgium’s Roger Janssen. The number three seed goes into the tournament as an outsider to lift the title and was off to a good start against an in form ‘Gizmo’. Janssen continued the momentum from yesterday’s preliminary victory over Wouter Vaes as he got off to a perfect start, taking the opening set 3-0 after winning the bull in practice room. As Williams found his form in the second set the 180’s started to flow. Three maximums would outline a superb set for the Welshman as he levelled proceedings. A further two sets would be exchanged on throw for the pair as we went to yet another pivotal final set. The number three seed would deliver what he has promised for so many years in a terrific final stanza, blowing Janssen away with a 92 average as his quest for a first BDO World Championship continues.